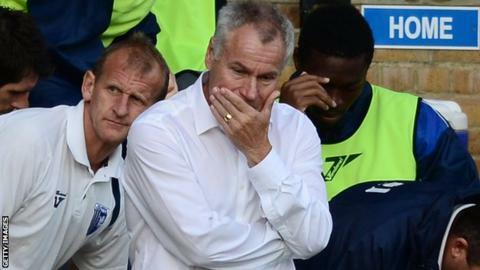 Gillingham manager Peter Taylor says supporters should be more understanding of their recent form. The Gills sacked Martin Allen last month after a dismal start to their return to League One and are currently two points above the drop zone. "I don't think they're helping the cause," Taylor told BBC Radio Kent. "There are too many who want to have a go at the manager, whether interim or not, or the players and that is not helping the players settle." He added: "They could be a touch more patient." Taylor took interim charge at Priestfield Stadium following Allen's sacking and was appointed until the end of the season earlier this week. Results have been mixed for the 60-year-old, who led the Gills to promotion to the second tier during the 1999-2000 season. The Kent club have won two and lost two matches in the league while a late Bradley Dack equaliser against Conference North side Brackley Town earned them a replay in the FA Cup first round. Taylor admitted last week that Gillingham are currently in a relegation scrap and has called on his players to improve their performances. However, he has warned fans to remain positive rather than criticise the team. "The players have got to hold their hands up as well," he said. "Some of the performances haven't been good enough, and they'll be honest with that. But just having a pop at them, that's not going to be helpful. "The most important thing is the players work hard. If they didn't work hard I'd be as critical as anyone. "But there's no lack of effort there. There's a lack of quality, but there's no lack of effort. "When a team are going through bad times, every time a certain supporter says something they say it's the worst performance they've ever seen. "No it's not. It's not that every week. You've got to be realistic."